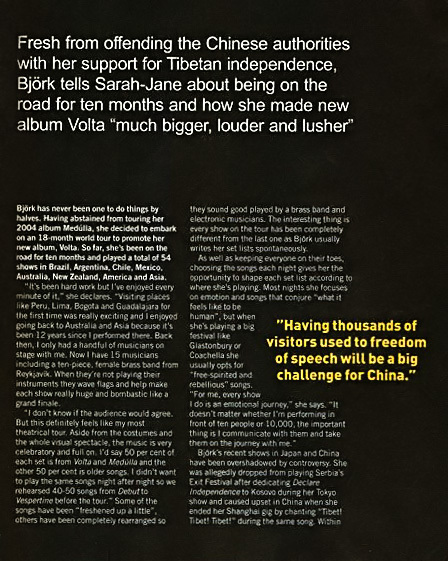 Fresh from offending the Chinese Authorities with her support for Tibetan independence, Björk Tells Sarah-Jane about bing on the road for ten months and how she made new album Volta "much bigger, louder and lusher"
Björk has never been one to do things by halves. Having abstained from touring her 2004 album Medúlla, she decided to embark on an 18-month world tour to promote her new album, Volta. So far, she’s been on the road for ten months and played a total of 54 shows in Brazil, Argentina, Chile, Mexico, Australia, New Zealand, America and Asia. It’s been hard work but I’ve enjoyed every minute of it," she declares. "Visiting places like Peru, Lima, Bogota and Guadalajara for the first time was really exciting and I enjoyed going back to Australia and Asia because it’s been 12 years since I performed there. Back then, I only had a handful of musicians on stage with me. Now I have 15 musicians, including a ten-piece, female brass band from Reykjavik. When they’re not playing their instruments they wave flags and help make each show really huge and bombastic like a grand finale. "I don’t know if the audience would agree. But his definitely feels like my most theatrical tour. Aside from the costumes and the whole visual spectacle, the music is very celebratory and full on. I’d say 50 per cent of each set is from Volta and Medúlla and the other 50 per cent is older songs. I didn’t want to play the same songs night after night so we rehearsed 40-50 songs from Debut to Vespertine before the tour." Some of the songs have been "freshened up a little", others have been completely rearranged so they sound good played on a brass band and electronic musicians. The interesting thing is, every show on the tour has been completely different from the last one as Björk usually writes her set lists spontaneously. As well as keeping everyone on their toes, choosing the songs each night gives her the opportunity to shape each set list according to where she’s playing. Most nights she focuses on emotion and songs that conjure "what it feels like to be human", but when she’s playing a big festival like Glastonbury or Coachella she usually opts for the "free-spirited and rebellious" songs. "For me, every show I do is an emotional journey," she says. "It doesn’t matter whether I’m performing in front of ten people or 10,000, the important thing is I communicate with them and take them on the journey with me." Björk’s recent shows in Japan and China have been overshadowed by controversy. She was allegedly dropped from playing Serbia’s Exit Festival after dedicating Declare Independence to Kosovo during her Tokyo show and caused upset in China when she ended her Shanghai gig by chanting "Tibet ! Tibet ! Tibet !" during the same song. Within 24 hours, her "outburst" was all over the national and international news, with government officials saying she had "aroused strong resentment" and forced them to "tighten controls" on foreign artists performing in China in the future. Björk insists she had no idea her actions would have such strong repercussions. "To the best of my knowledge, there was no negative reaction from the audience that night," she says. "I’ve heard that I offended and upset a lot of people but I didn’t feel any hostility from the audience. I think the reaction has been completely blown out of all proportion. I didn’t give a long speech about human rights or suppressing overseas territory, I literally chanted the word Tibet three times at the end of the last song." Though she insists that she doesn’t know anything about politics, Björk feels it’s her duty as an artist to write songs about humanitarian issues. Thus, Declare Independence is a call to all countries from China to Denmark to liberate provinces they have claimed as their own historical territory. "I think what I tapped into in Shanghai, without knowing it, is China’s determination to be the world’s next superpower," she says. It’ll be interesting to see what happens in the run-up to the Olympics because they’re still learning how to communicate with Western civilisation and I think having thousands of visitors who are used to freedom of speech will be a big challenge for China." Björk still loves performing but doesn’t have as much energy as she did when she was younger. "The travelling on this tour has been really tough. The only thing we have the time to do between shows is eat, sleep and travel. I’m an iPod shuffle girl so wherever I am I just press play and see what comes on." Her passion from everything from minimalist techno to free jazz has been well documented. What some fans might not be aware of, however, is that the artist that inspired her to start writing her own songs was Joni Mitchell. Introduced to her music by a friend, she played Don Juan’s Reckless Daughter so frequently she knew every lyric, chord progression and melody by the time she was 15. "Growing up in Iceland I had no knowledge of Joni’s impact on the whole hippy era and the Californian folk scene," she states. "I just fell in love with her music. To me, it seemed very pure and intuitive, like she just followed her heart and wasn’t influenced by anyone else. Most of the music around at that time was created by men and the few female songwriters what were around were usually backed by male musicians. In comparison, Joni created her own musical universe with female emotion, energy, wisdom courage and imaginations. I found that very liberating." 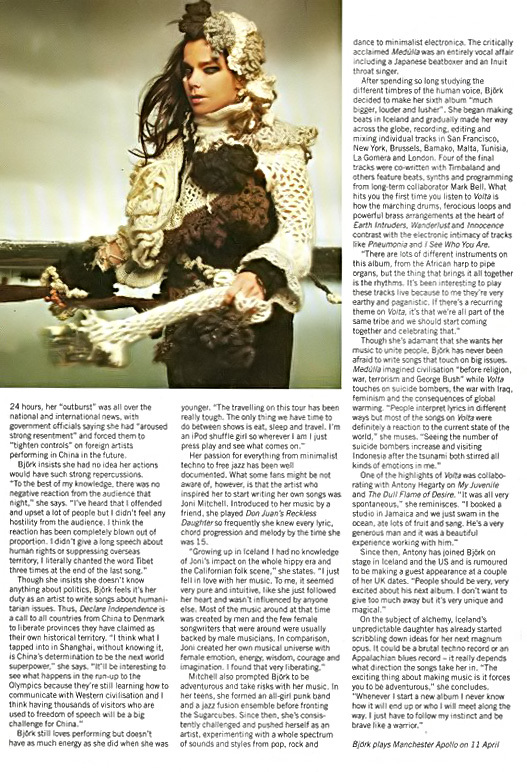 Mitchell also prompted Björk to be adventurous and take risks with her music. In her teens, she formed an all-girl punk band and a jazz fusion ensemble before fronting the Sugarcubes. Since then, she’s consistently challenged and pushed herself as an artist, experimenting with a whole spectrum of sounds and styles from pop, rock and dance to minimalist electronica. The critically acclaimed Medúlla was an entirely vocal affair including a Japanese beatboxer and an Inuit throat singer. After spending so long studying the different timbres of the human voice, Björk decided to make her sixth album "much bigger, louder and lusher". She began making beats in Iceland and gradually made her way across the globe, recording, editing and mixing individual tracks in San Francisco, New York, Brussels, Barnako, Malta, Tunisia, La Gomera and London. Four of the final tracks were co-written with Timbaland and others feature beats, synths and programming from long-term collaborator Mark Bell. What hits you the first time you listen to Volta is how the marching drums, ferocious loops and powerful brass arrangements at the heart of Earth Intruders, Wanderlust and Innocence contrast with the electronic intimacy of tracks like Pneumonia and I See Who You Are. "There are lots of different instruments on this album, from the African harp to pipe organs, but the thing that brings it all together is the rhythms. It’s been interesting to play these tracks live because to me they’re very earthy and paganistic. It there’s a recurring theme on Volta, it’s that we’re all part of the same tribe and we should start coming together and celebrating that." Though she’s adamant that she wants her music to unite people, Björk has never been afraid to write songs that touch on big issues. Medúlla imagined civilisation "before religion, war, terrorism and George Bush" while Volta touches on suicide bombers, the war with Iraq, feminism and the consequences of global warming. "People interpret lyrics in different ways but most of the songs on Volta were definitely a reaction to the current state of the world," she muses. "Seeing the number of suicide bombers increase and visiting Indonesia after the tsunami both stirred all kinds of emotions in me." One of the highlights of Volta was collaborating with Antony Hegarty on My Juvenile and The Dull Flame of Desire. "It was all very spontaneous." she reminisces. "I booked a studio in Jamaica and we just swam in the ocean, ate lots of fruit and sang. He’s a very generous man and it was a beautiful experience working with him." Since then, Antony has joined Björk on stage in Iceland and the US and is rumoured to be making a guest appearance at a couple of her UK dates. "People should be very, very excited about his next album. I don’t want to give too much away but it’s very unique and magical." On the subject of alchemy, Iceland’s unpredictable daughter has already started scribbling down ideas for her next magnum opus. It could be a brutal techno record or an Appalachian blues record—in really depends what direction the songs take her in. "The exciting thing about making music is that it forces you to be adventurous," she concludes. "Whenever I start a new album I never know how it will end up or who I will meet along the way. I just have to follow my instinct and be brave like a warrior."